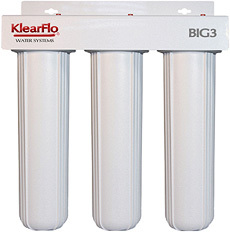 Our KlearFlo Whole House Cartridge BIG2 and BIG3 are ideal for apartments, condos, RV's or for those who are limited on floor space or simply those who do not want backwashing or do not want to require electricity in order to filter unwanted contaminates from their water. 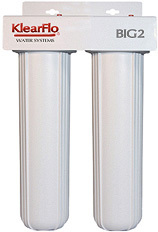 Unlike other standard big 10" cartridge filters, our big 20" filters last for up to 12 months, and they allow higher flow-rates. Better tasting water from every tap in your home. Softer Skin & Hair without the use of salt. No backwash, No wasted water, No required drain. Drink, bathe and shower in cleaner water. No more dry itchy skin or unpleasant odors from the chemicals in your water. While municipalities add disinfectants such as chlorine or chloramines to reduce illness-causing bacteria in your water, the by-products they produce pose serious health risks. Many contaminates and DBPs are just as dangerous when inhaled during a warm shower and absorbed through the skin; why it's better to bath in filtered water. Having the KlearFlo Whole House Cartridge BIG2 or BIG3 on your cold main prevents unwanted DBPs and other harmful contaminates from entering your home. 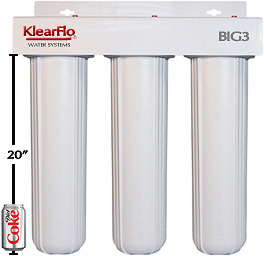 With our space-saving KlearFlo Whole House Cartridge BIG2 or BIG3, you have cleaner water with very little effort or space. We recommend changing our cartridges every 12 months. The main function of carbon filters is to remove the bad taste and smell from the drinking water along with unwanted chlorine and toxins. Carbon filters do not require a lot of maintenance, and with proper filter changes they can provide better tasting and safer water. With improved taste, the filters also remove odor. They provide an excellent value for your money and are definitely a better choice than bottled water. If you've cooked pasta in filtered water or made coffee or tea using filtered water, you can definitely tell the difference. Chlorine and toxins adsorb into your foods. They make your sauces and hot drinks taste foul. All top restaurants, chefs and coffee houses use carbon filtered water--this is how they produce better tasting food and drink. Just like swimming in a chlorinated pool, showering in chlorinated water affects your skin and hair. Over time the chlorine or chloramines will dry out your hair. Your skin is an organ, your pores soak up chlorine or chloramines while showering. Because your skin does this, it can leave your skin itchy and uncomfortable. We also now know, these dangerous chemicals and combined by-products can be inhaled from the vapors caused by steam. Pre-filter - The sediment pre-filter cartridge reduces sand, silt, sediment and debris in the supplied water. Routine replacement of this sediment cartridge will increase the effectiveness and protect plumbing and appliances from sediment. 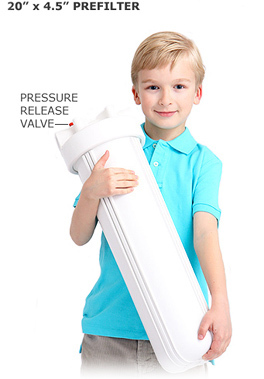 With average use, each filter is effective for up to 12 months. Iron Filter - Our KlearFlo Iron cartridge thoroughly reduces up to 3 parts per million (3 PPM) of dissolved iron from water. 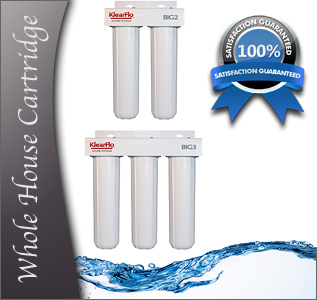 The KlearFlo Iron cartridge improves the metallic taste caused by too much iron in water - it will also reduce the orange and brown staining which is commonly found in sinks, toilets, tubs, and other plumbing fixtures due to overly high iron content in water. With average use, each filter is effective for up to 12 months. Coconut Fiber Activated Carbon Filter - Our KlearFlo coconut carbon cartridge boasts high quality coconut shell carbon allowing it to reduce impurities found in water, such as odor and contaminants, while also improving it's taste. This coconut carbon filter can reduce contaminants like rust, dirt, and carbon fines, and also reduce high levels of chlorine and chloramine. With average use, each filter is effective for up to 12 months. It is important to understand how the carbon filter inside the KlearFlo Whole House Cartridge works; Adsorption: the process by which matter (chemicals) adheres to the surface areas of a solid adsorbent material (carbon filter). In layman's terms the chemicals in your water are adsorbed into the carbon filter on contact. 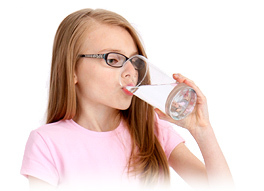 The carbon filter does not release any chemicals back into your water once they are adsorbed. We offer the replacement cartridges as a more cost effective and environmentally friendly approach. When it comes time to replace your cartridges, you are not throwing away the assembly or having to try and dispose of a complete system. KlearFlo Water Systems warrants to the end user (customer) that it's BIG2 and BIG3 housing and mounting bracket will be free from defects in material and workmanship under normal use and service for the life of the system. No warranty is made with respect to defects or damaged due to neglect, misuse, alterations, accident, misapplication, physical damage, installation on water quality outside guidelines for system or damaged caused by fire, acts of God, or freezing. Copyright © 2019 KlearFlo Water Systems, Inc. All rights reserved.